Tips from the combined experiences of the SimNation Guild membership. Information for the SimCity BuildIt mobile game. Use the navigation buttons at the top of the page to find your way around or continue reading below for all of my blog posts. I'd like to thank everyone in the grooviest Sim City guild around, The SimNation Guild on Facebook for coming up with many of the tips found here through many hours of gameplay, discussion, and sharing. Many of the tips were written by various members and I've been trying to document them all here for everyone's benefit. Did you find a bad link, error or omission? Do you have a question? I hope you find this website helpful and it makes the game more enjoyable for you! When CoM got introduced I participated for a while and made some good efforts at advancing and winning the whole thing. I eventually got sick of the entire endeavor because it seemed like so much of it was based on luck. One person could do all of the highest point tasks, and yet still not win. So while others participated, I generally would only do the easiest tasks in order to earn the minimum required to get the Club Challenge rewards. When wars got introduced, I jumped into that with full spirit and would often be one of the top scorers. 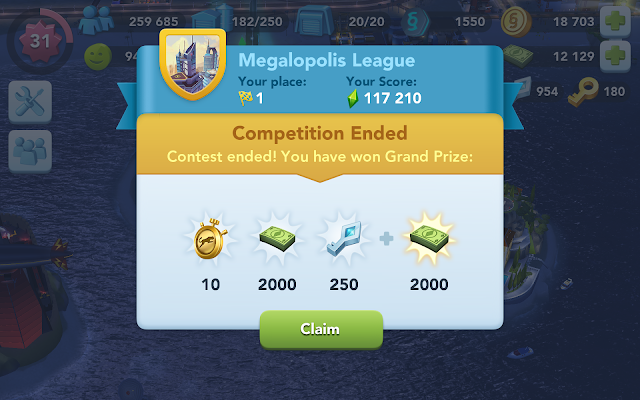 Eventually I decided to make a second city so I could earn more points for my team. 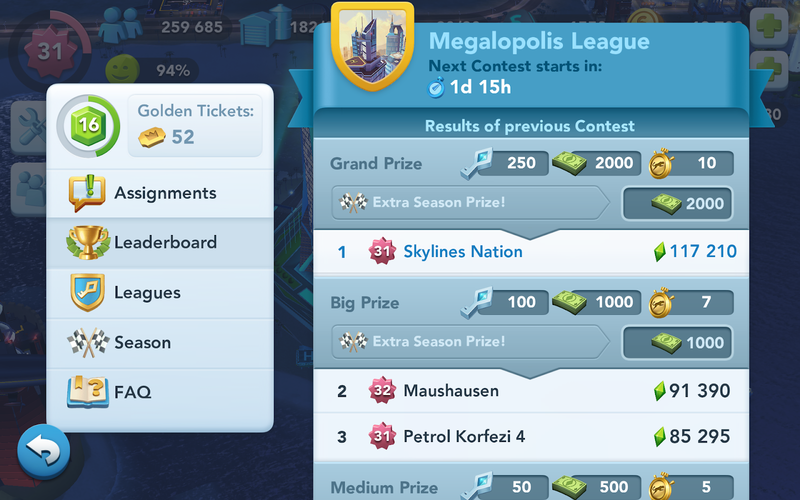 I purposefully kept that second city small, and like my main city, would do just enough to earn the Club Challenge Rewards in CoM. I never paid much attention to CoM since I really wasn’t doing it, and eventually noticed I was in Metropolis league. How? I had no idea. One look at the scoreboard showed that the leaderboard was mostly empty. The other people who had the same low contest rank as me just didn’t participate in CoM. Thus, without even trying, my super low scores of 1500 or 2000 points were enough to advance to the next stage. Use a feeder city. Keep it as low a level as possible. Preferably below level 30. Barely advance to the next stage by keeping your CoM scores as low as possible, yet still advancing. Once you get to Metropolis, make your best attempt..
That second attempt earned me first place, netting me $4,000 sim cash. I took a bit of a break to build up my Vu supply and then made another attempt, again winning first place, netting another $4,000 sim cash. Since then, I've repeated it again it with a 3rd place finish and another grand prize. About $300 sim cash saved up from wars. Keep an eye on the sim cash amounts that you can potentially win. Know that the sim cash you spend is an investment into guaranteeing a larger payday at the end. You've probably grown accustomed to not spending sim cash on anything, but when you are trying to win the title, spend sim cash, and spend it freely. I spend anywhere from $50 - $250 sim cash for each win, but considering the difference between 1st and 2nd place is $2,000 sim cash, it was a calculated decision and one I don't regret. Although I think this method is a much easier method than trying to fight it out with the big dogs, there is no guarantee you'll win. I think luck still plays a factor. One of my wins was by less than 100 points. I wouldn't be surprised if the programming rewards players who spent the most sim cash. So when you try to make a run for the title, do so making sure you can still earn enough to cover the sim cash expense and/or be happy with a top finish of 2nd-5th place or whatever your break even point is. The rewards are much greater during a season, so I would highly recommend only doing this during one. The more you play, the more your contest rank will increase and the competition will be harder, so keep that contest rank low and only go for it when it really counts. Each player has 10 health. Each player has a 12 slot energy bank. You start off with 6. The Dome: Once your health goes to zero, no one can attack you until you completely rebuild. You will often be rewarded with war items for rebuilding. Who can start a war? 1X Speed (15 min per 1 energy) -- All but the last 2 hours. 3X Speed (5 min per 1 energy) -- The last 2 hours of war is at 3X speed. Watch out: Some teams will jump out to a higher score, and then hide out while their entire team is under a dome. They’ll just quit playing, and really who likes doing that? To combat that, you need to maximize your ability to score points. You can do that with the following strategy. Take your opponents down to one health left. Use a high point disaster (6 points or greater) as the final one to put a dome over them. Why waste a high point disaster on an opponent with only one health? You will be rewarded the full amount of points no matter how much health the opponent has. Have a teammate knock an opponent down to 1 health. Your team will have earned 900 points. If you then use your own 9 point disaster to knock them from 1 health down to 0, you will still earn 900 points even though you've only removed 1 health. By using this method, your team will have earned 1,800 points off of an opponent’s 10 health. Multiply this over 25 opponents on the other team, the potential score you can obtain from your opponents will increase substantially, thus limiting the ability of the opponents to jump out to a lead and hide under a dome. Minimize the other team's ability to score off of your 10 health. Don't rebuild your city until you're under a dome. Rebuilding allows the other team to score additional points off of your 10 health. Attack right as you reach a max energy of 12. Make sure you can score a full 12 points. If the other team is not employing these strategies, they'll limit themselves to 10 damage, and you will have gained a 2 point advantage. The maximum number of energy saved in the full 36 hours is 166. That equals a base score of 16,600 if each attack earns you 100 points. When you reach level 2, your attacks will earn an extra 10% i.e. 110 points for a 1 point attack. Thus if you want to earn two gold chests you'll need to make sure you attack pretty much every single time. Once you reach level 2 or 3 on some of your attacks the extra bonus points will add up, allowing you to skip an attack or two and still hit 16,000. The waiting period for the next war to begin is 12 hours. Note: If you do not attack the enemy, you will not earn any rewards. Over time you will be rewarded randomly with disaster cards. Once you obtain enough cards, certain disasters will unlock. You will earn additional points with weapons at higher levels. For instance, a level 2 weapon will earn 110 points per one health. I've heard that burger farming does not work as well as it used to. You can still use the techniques listed below, but the burger deals don't exceed 20 burgers at a time. However, I have not confirmed this. Please leave a comment below if you've tried it recently. "Burger deals", "Coin deals", "Burger farming". I'm not sure what exactly to call it, but there's a secret method of making money that has become the "Fight Club" of SC BuildIt. "The first rule of burger deals, is don't talk about burger deals." The theory has been that it's such a great method of making money, that if word got out...everyone would start doing it. If everyone starts doing it, the developer would then rid the game of this method of earning money. I've never fully agreed with that theory and meanwhile I've seen people hinting at it and talking about it more often. I've even seen a youtube video on it. So here you go: I'm breaking the First Rule. Many of the top players are using multiple methods to earn their cash. They manufacture goods 24/7, selling everything off for pure profit. They trade away rare items for greater than max value. They make multiple "feeder cities" using separate accounts/devices thus allowing them to make and sell even more goods. Shhhhhh..... They supplement their income with "burger deals"
OK. So what is a burger deal? If you click on the coin icons that pop up on various buildings, you will be offered to sell off some random items. You've probably become accustomed to just dismissing them because you don't want to sell off your rare items. If you do the calculations you'll notice that the offers vary in price, from a bad deal (less than face value) to an ok deal (slightly over face value) to great deals (30%+ profit). Sell off everything but your burgers. Buy all the burgers you can find. If you see an offer for $900-$1000 above max value per burger: Take it! Burger deals only originate from police precincts. If you don't see a deal pop up, buy a burger at the Trade HQ. Dismiss deals that you don't want to take. The more you take burger deals, the more difficult it will become to find burgers at the Trade HQ. Once this happens you're better off going back to your regular gameplay of making and selling goods. Once you start seeing burgers in the Trade HQ again, you can sell off all your items and try the burger method again. I've compiled all of the stats for the parks in the table below. In order to calculate an efficiency, I've multiplied the area x bonus. The higher the number, the more efficient the park is. In the table at the bottom of the page, I've grouped them by their size. I prefer to use the skinny parks that are one square wide.